Dimity Stoyle is chaired up the beach after her win. DIMITY Stoyle is on course for the 2014 World Tour after she yesterday captured the biggest result of her burgeoning career with victory at the Hunter Ports Women's Classic in Newcastle. 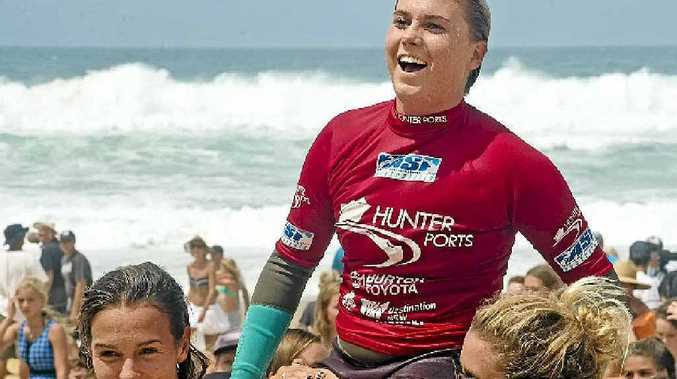 The 21-year-old caused a boilover in the final of the ASP 6-star event at Merewether Beach when she defeated 2012 World Championship runner up Sally Fitzgibbons 14.67 to 13.67. Her first senior ASP event win will give her a confidence boost and a wind at her back heading into this week's trials for the first event of the 2013 World Championship Tour season, the Roxy Pro at Snapper Rocks. However, it had more important ramifications for Stoyle's quest to qualify for next year's WCT - it put her in second spot on the World Qualifying Tour rankings, behind Fitzgibbons. She must finish in the top six of this year's qualifying tour rankings to graduate to the main tour. Having already put points on the board with her fifth at the Breaka Burleigh Pro, by her estimation she just needs a few more good results to get over the line. Also the $8000 winner's cheque will bankroll her trips to the four remaining 6-star events in Peru, France, Spain and Portugal. "If I can just make it through a few more rounds, I should set myself up really nicely," she said. "I've made a really good start, now if I can start to make a few more of the later rounds and make another final." Meanwhile, Coolum's Julian Wilson was eliminated from the semi-finals of the men's event, the Burton Toyota Pro. Wilson tied with Alejo Muniz on 15.67 points in the round of four but the Brazilian was awarded the heat on a countback. Muniz was defeated by Joel Parkinson in the final.